Boy with Drumstick, this Norman Rockwell painting, appeared on the cover of Boys' Life published November 1913. This marked Rockwell's third cover publication. Boy Scout readers had already become familiar with Rockwell's work through his article and story illustrations in previous editions of the magazine. Rockwell had been serving as the art director of Boy's Life since being hired in 1913. Boy's Life magazine was the 18 year old Rockwell's first job with a magazine. Before being hired by Boys' Life, he had been painting mostly commission work. This included Christmas cards and portraits. 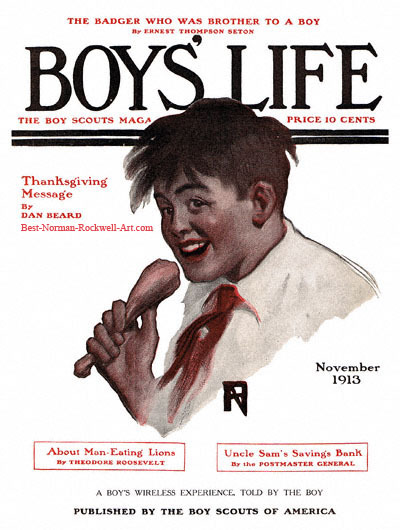 The first issue of Boys' Life was published in March of 1911. The magazine was still a fairly new publication in 1913. I like to believe that a large part of Boys' Life's early success was due to its fine young art director. Comparing this painting to Norman Rockwell's first Boys' Life cover, his growth as an artist is evident. Even in his early days, Norman Rockwell kept his work topical. That is, he painted current events whenever possible. This painting is no exception. This painting was only one of 55 Norman Rockwell Boys' Life covers; here is the list of more Norman Rockwell Boys' Life covers, advertisements and story illustrations. Here is a portrait of a boy enjoying a drumstick as part of his Thanksgiving feast. The drumstick looks big enough to be a turkey leg, as opposed to a chicken leg. He must be at Grandmother's house. He is wearing a red necktie and white shirt. The twinkle in his eyes and his rosy cheeks tell us how much he enjoys Grandmother's Thanksgiving dinner. Allposters.com has the largest selection of Norman Rockwell Boys' Life Posters I have found anywhere. I have taken the liberty to find them for you. Just click on the picture you want and you will go to the order page.